I have been following several people on social media over the last few years about agriculture issues. I have been getting side feeds trying to explain use of glyphosate to the urbanites and suburbanite. Really do I need to see one more video trying to explain 22 ounces of liquid covering a football field? Why don’t the farmers explain it from urbanites and suburbanites perspective and knowledge base. Maybe then, they’ll get it! First a little background. I grew up in the suburbs of St Paul Minnesota. My mom and dad were raised on dairy farms. 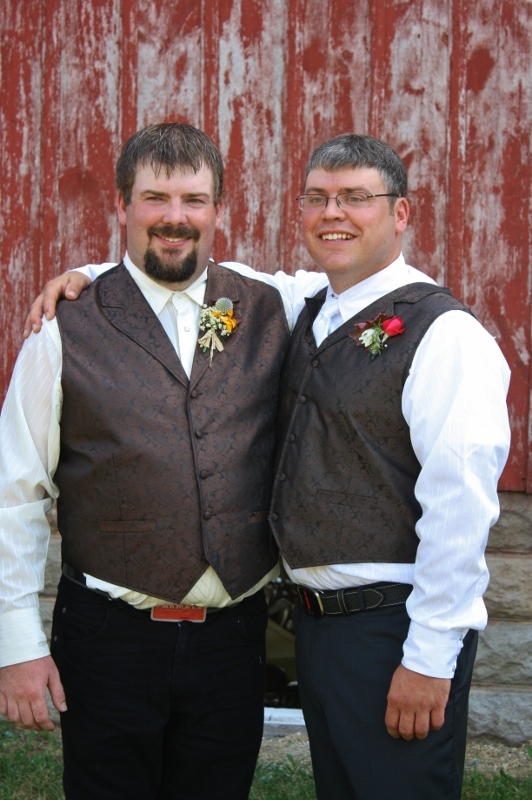 After they were married, they moved to the St Paul area and raised their family. 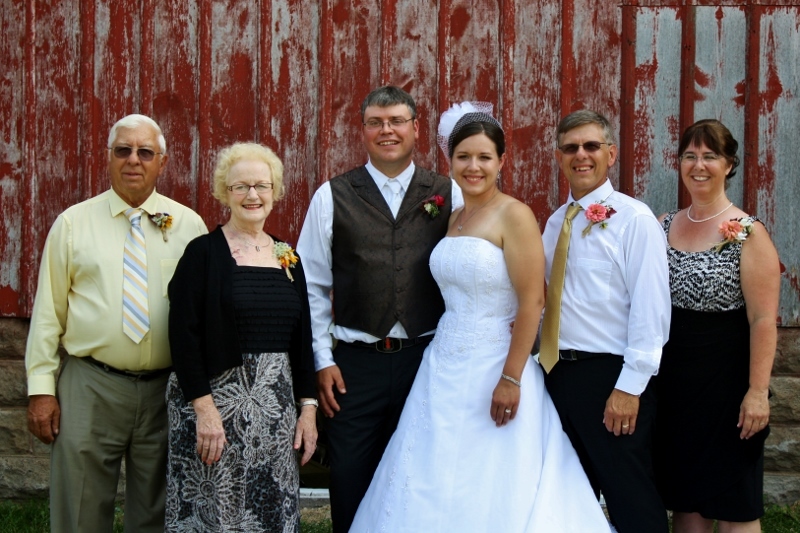 My grandparents, on my dad’s side, continued to dairy farm. We would go to their place when I was a child and spend the weekends. My grandparents farm was 160 acres of corn, oats and hay to feed their milking herd of 25 cows and young stock. Part of the acreage was pasture ground and so the managed acreage was about 120 acres. My grandpa’s biggest tractor was 60 horsepower and that’s small by todays agricultures standard. When I was 20 I moved from the big city (so did my parents and family and bought their own dairy farm) back near my grandparents farm I and got a job on a neighboring farm. This farm was a bigger dairy farm. On this farm we milked 78 cows and had young stock. The farm was about 450 acres raising corn, oats and hay. Some of the acreage was in pasture ground. 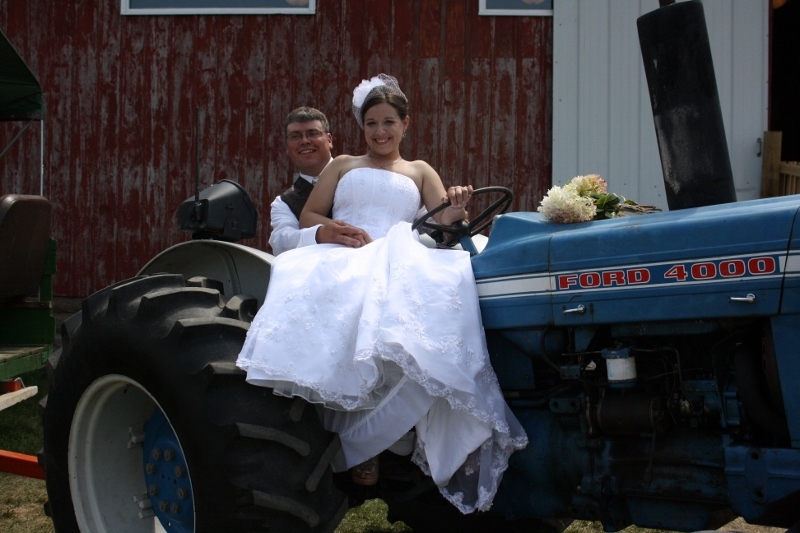 The biggest tractor on this farm was 120 horsepower. This is the small tractor on todays farms. I worked on this farm for 13 years before I left and went to work in town. 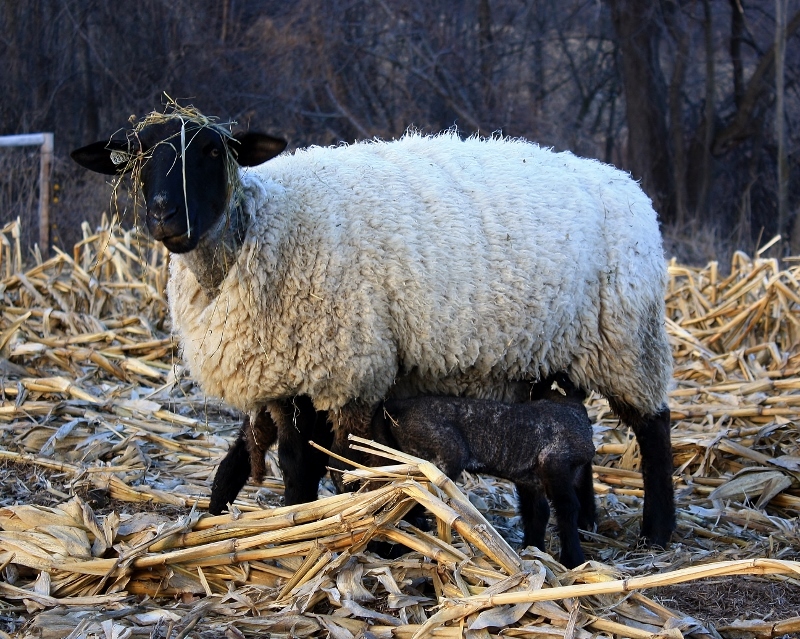 About 15 years ago my youngest daughter took sheep as a 4-H project when she was in her junior year of high school. She moved on with her life and the sheep stayed. At first the sheep were urban sheep. 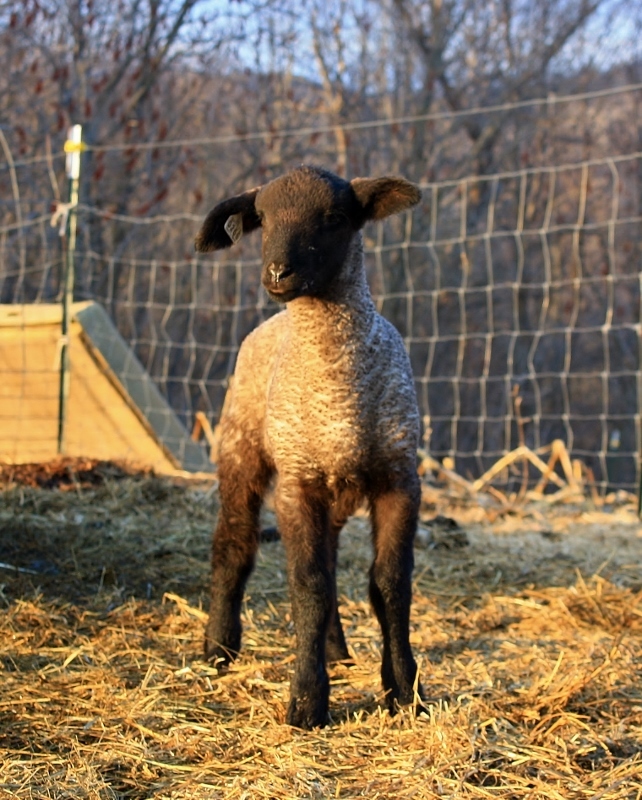 When me and Laurel build a new home in the country we moved the sheep to our new home on 13 acres. We have about 2-1/2 acres of tillable land and the rest is pasture and woods. I manage my land with a 1952 Ford 8N tractor with a whopping 23 horsepower. Most of my feed is raised on my dad’s farm. So there in a nut shell in is my farm knowledge base. Laurel and I have gardened most of our 35 years of marriage. At first we gardened like farmers then transitioned to gardening on the square foot method. The gardening as a framer we would plow with a tractor and use wide row methods so we could till the ground between the rows of plants. As we learned more about gardening we moved to permanent 4 foot wide raised beds. I would till the soil with a garden fork and the tiller was idled. The beds were planted on the square foot method and mulching of the beds was used to suppress weeds and conserve moisture. At our new home our vegetable garden is the barnyard. Each spring I clean up the manure pack and reset the fence panels to create the garden. Back to the days of plowing and wide row plantings. Today we mostly plant tomatoes green beans for canning. We also grow a variety of peppers and sweet potatoes. We gave up on regular potatoes and squash because of the bugs. We also have a small terraced garden near the house were we plant carrots, beets and spinach. The terraced garden is heavily enriched with compost. Now I know your starting to think, this guy has a wide base of knowledge. Is he conventional or organic? Is he large scale gardening or small scale farming? Or is he a hybrid of both systems. Dad continues to farm raising corn and soybeans and a few acres of hay for me and a neighbor who bought his beef herd. The corn and soybean seed is Round-up ready, meaning it is GMO seed. A few years ago I got my applicator license so I could purchase chemicals and apply them to the fields. As time marches forward and dairy industry has left our area. 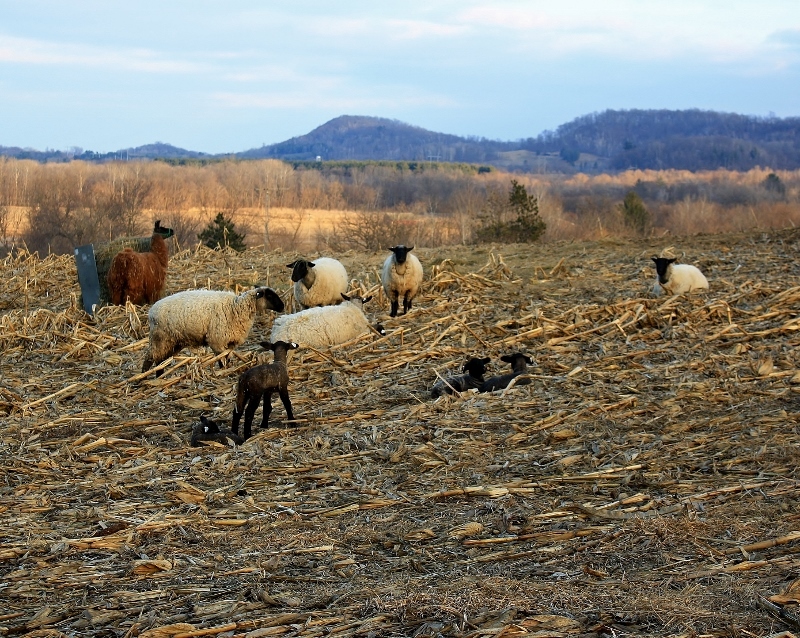 The cover crop of hay ground is being replaced with the row crops of corn and soybeans. This is happening to the hillsides where 30 years ago corn would have been planted for one year and the back to hay ground via oats as a nurse crop. The farmers were spreading manure back to the fields enriching the fields. Today the fields are being fed fertilizers to feed the corn and soybeans. This brings me back to my earlier question. What is your knowledge base? I understand gardening and small dairy farming. But…. Do I understand milking 500 or 1000 cows? Do I understand managing 1000 or 5000 acres of corn and soybeans. How about 10 sections of wheat? Dad’s corn planter is 4 row, and in America’s corn belt farmers are using 24 and 36 row corn planters. Dad just follows a mark in the soil to keep the corn rows parallel. The big planters are using GPS to keep their row parallel when they plant. I have sat in some of the biggest tractors with all their buttons and switches and thought learning to fly a airplane would be simpler. So if I am overwhelmed with the size and technology, what about a urbanite or suburbanite? If they have one tomato plant on their deck why can’t 40 acres of tomatoes be managed in the same way? If they have a grouping of small raised garden beds or a garden 30X30 and they are able to manage after a hard day at work with a hoe and pulling a few weeds so why do the farmers need chemicals? Can’t they manage the crops in an organic way? I have though about that. Laurel and I are sometimes overwhelmed by our garden that is 30X30 with all the weeding. Lets make the garden bigger. Let say 320 acres. For you that are struggling with size, 320 acres is a area 1 mile by a half a mile. If I wanted to plant a 320 acre field of soybeans and keep it organic, how do I control the weeds? One method is to walk the fields hoeing out the weeds. Let stop and do the math. I first have to determine how wide of a path I can manage weeding. Lets just say 20 feet. So I will walk 1 mile weeding a strip of soybeans 20 feet wide. When I reach the end of the field I will move over 20 feet for the return trip. I will continue this across the field. A half a mile is 2640 feet at 20 feet a time is 132 times I would walk a mile. For all you runners, that’s 10 half marathons! That’s one field of soybeans in America. Who’s going to do this all this walking? You don’t get all summer to weed you maybe get 30 days in the heat of July. Gardens aren’t small fields and fields aren’t big gardens. Each has their own style of management. If as a gardener you lose your tomato crop you maybe had a financial lose of $100 and will have to buy your canned tomatoes from the store. If a farmer loses their tomato crop there is no paycheck! But the bank loan for the plants, fertilizer and fuel still needs to be repaid. Back to glyphosate. Why do urbanites and suburbanites think the farmers douse their fields in glyphosate? Look at their knowledge base. As I was watching a commercial for Round-up on television and saw how much chemical the homeowner is applying. He was dousing the poor little plant ensuring its demise. Maybe that is where the public gets their vision of dousing weeds in chemicals on the farm. The homeowner could have bent over and pulled the weed with same results, but that would sell product. If he walked his patio, how many miles would he have walked. At the end of the commercial it shows the homeowner lying in a hammock enjoying the fruits of his weed free lawn and patio. Is that how the urbanites and suburbanites see the farmers? We just spayed our fields with glyphosate and now lying in a hammock wait for the crop to be harvested? Please stop trying to explain things from a farmers point of view. Break it down to something I can relate to and is in my knowledge base as an urbanite and suburbanite. Maybe that will leave me with a better understanding of your choices as a farmer. I guess that’s how I see it. Thanks for reading my point of view. With a new family united before God , family and friends, we were ushered out of the barn to give our congratulations to the bride and groom. With the receiving line formed on the ramp, Sarah and Josh found themselves standing in sunlight making it unbearable. We spotted some shade next to the barn and moved the receiving line to the shade. Laurel and I met many new people. Many of them Josh’s family and friends. 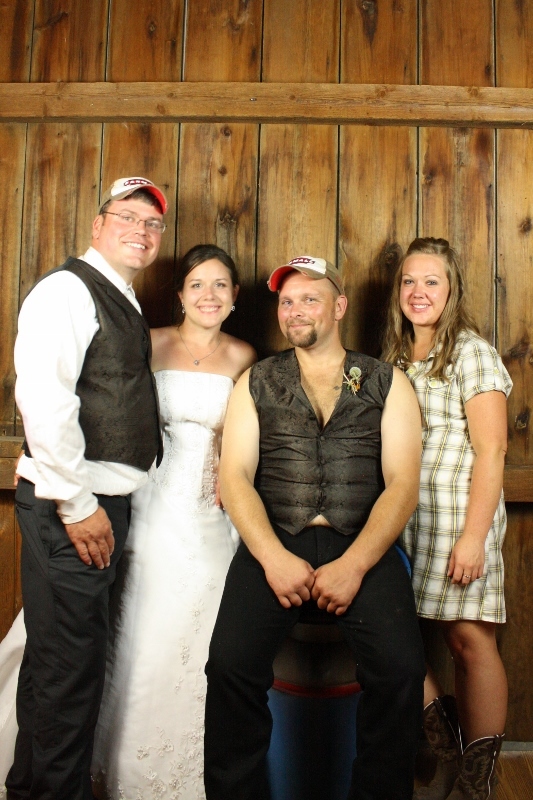 As the well wishes faded away and grabbed a cool refreshment the wedding party boarded a farm wagon loaded with a cooler of beer and did their version of a limo ride. 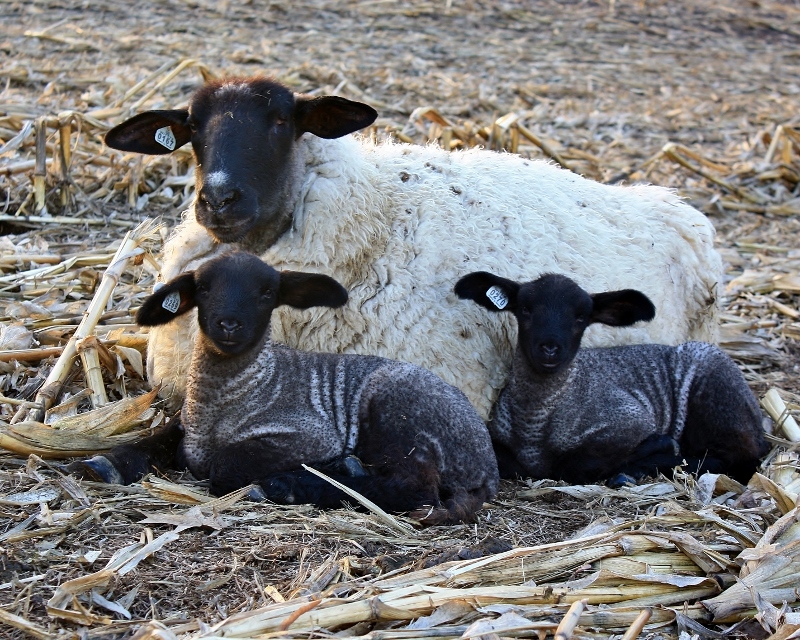 They went around the small town of Rusk and headed to Govin’s Lambing Barn Farm. 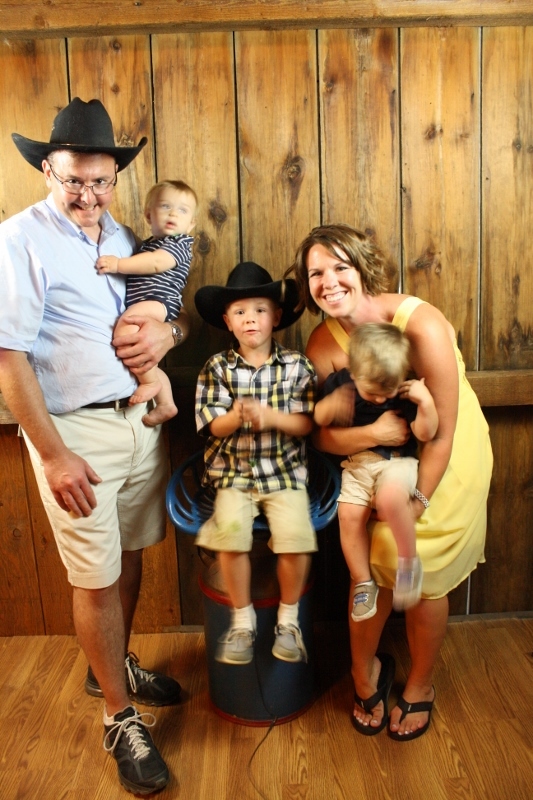 A couple of years ago John and Julie put in a bouncy pillow at the farm as entertainment for guests visiting the lambing barn and their corn maze. I haven’t seen any photos yet, but I heard they had a great time jumping on the pillow. On the way back they stopped along the road taking photographs of the wedding party in the corn fields and soybean fields. The photographer went with on the ride to document all the fun. I know it will take time to get the photos developed, but as soon as I can I would like to insert some into this post or start a new post. 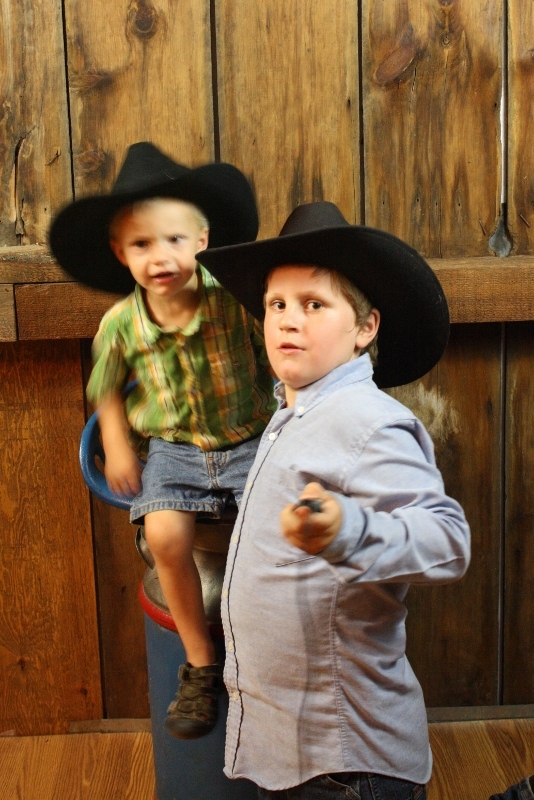 The party returned to the Weddin’ Barn and the guests were waiting patiently for dinner to begin. The wedding party did a grand march in to the dinning area and a prayer was said. The wedding party headed for the food line with the family following. The ushers released the guests from their tables and it wasn’t long all the guests were eating a fine meal. 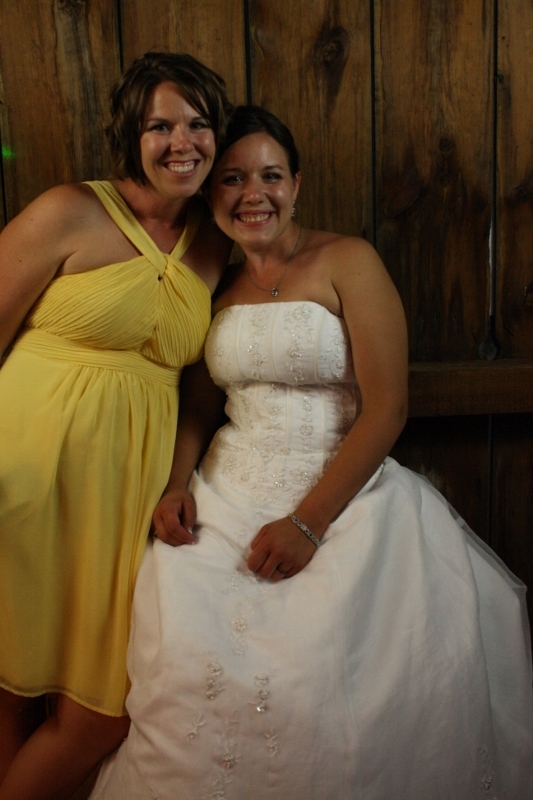 As the guests finished we headed back up to the hay mow for the big wedding dance. The lights were dimmed and the DJ’s music and lights filled the mow. 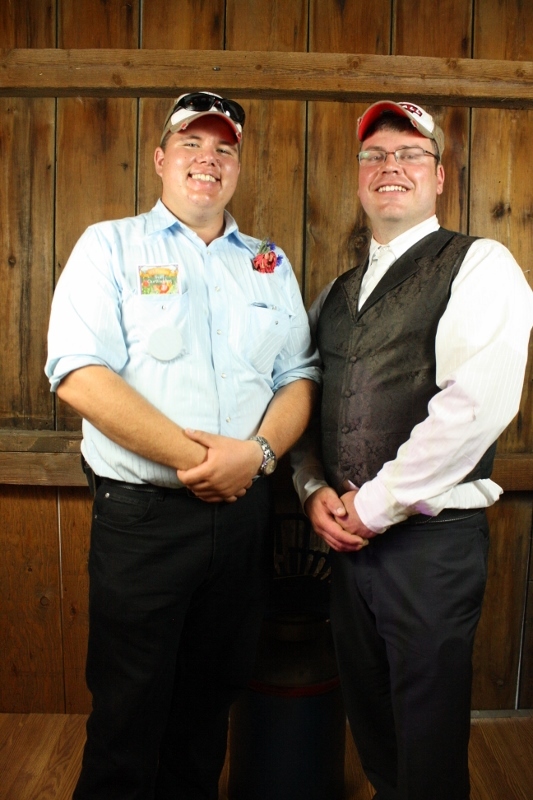 Now I must say, this wedding is a family affair. The DJ is my son-in-law Paul. Paul married my daughter Beth two years ago and Paul has been in the DJ business for about 20 years. I think he has about 130,000 songs on his computer! If your having a dance or a party he probably has your song. But as music tastes change and new songs come out he is constantly adding new music to his library. First called to the dance floor, the first dance as Husband and Wife then the Father-Daughter dance. The floor was opened and the guests danced the night away, while others sat with each other in conversation. It was a wonderful time getting to know friends and family of Sarah and Josh’s. Now I’m sure you are noticing I haven’t included any photos. I didn’t have my camera at hand since they were pronounced husband and wife. I had set my camera up for a photo booth area in the mow. So I am hoping friends and family will share their photos with me so I can share them with all of you. 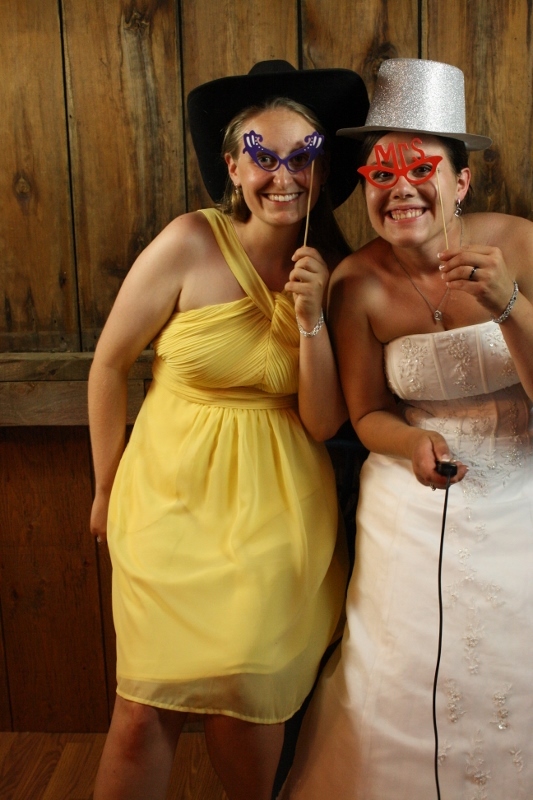 Back in January when Laurel’s niece got married, the photographer set up a make shift photo booth. I sat and took in all the positives and negatives of their design. They had just did a white drop cloth with a taped box on the floor and a wireless remote so people could snap their own photo. 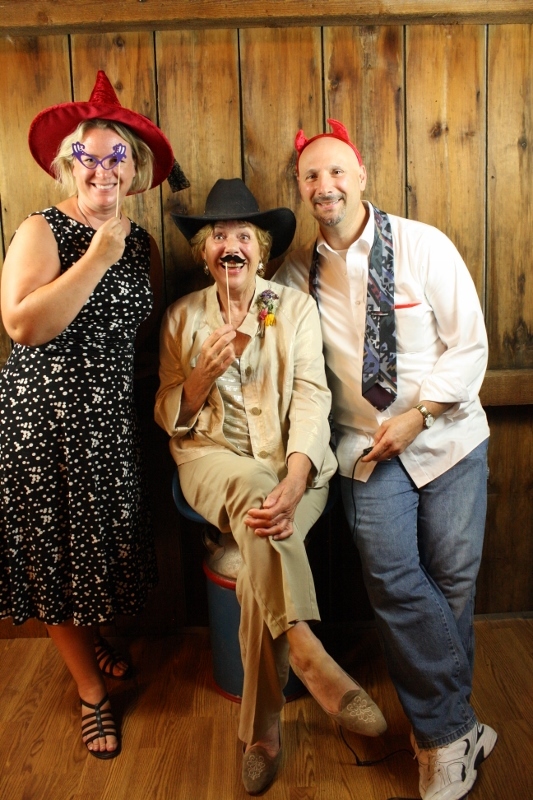 It seemed to overly crowded and yet the guests needed to be squeezed as in a photo booth. It worked and it was great to see people having fun in front of the camera. 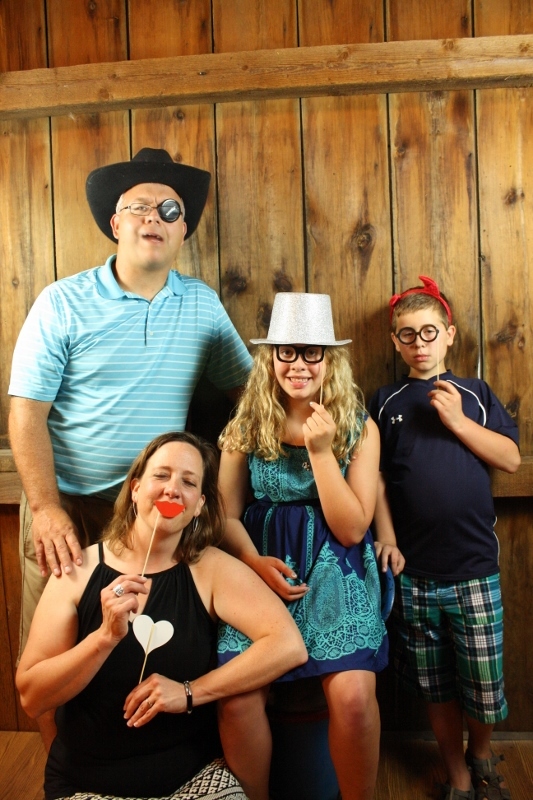 I made a comment and I was left in charge to do a photo booth for Sarah and Josh. With the darkness of the night and in the barn I knew I would need lighting. I did some looking around on the web and was taken back by the price of lights. As time slipped by and we were a few weeks from the wedding, Becca suggested I take look at Amazon and I found a lighting set for fifty dollars. Its nothing fancy just a three light stand system with compact lights on a steady glow. When I ordered the lights I also had to order a extension cord for the remote switch. My camera doesn’t have an inferred eye so I have to us a cable. I took many test photos at home seeing how the system would work. 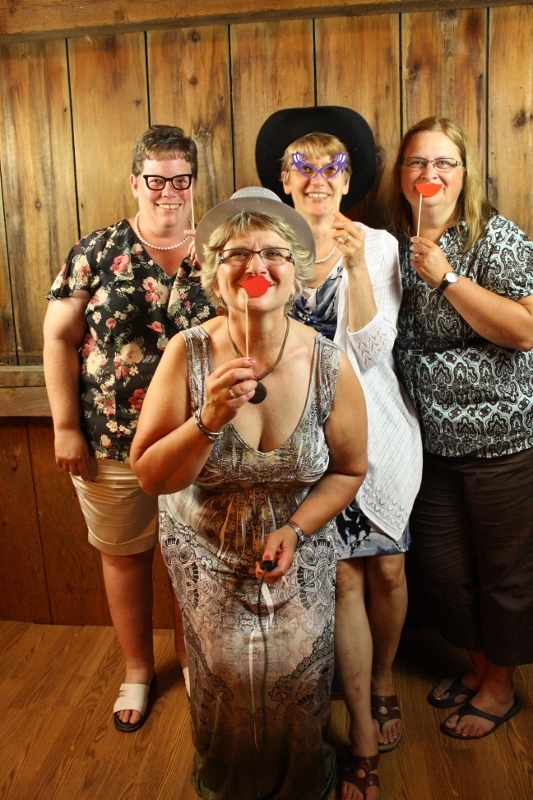 I was pleased with the results and was looking forward to the photo booth in the barn. 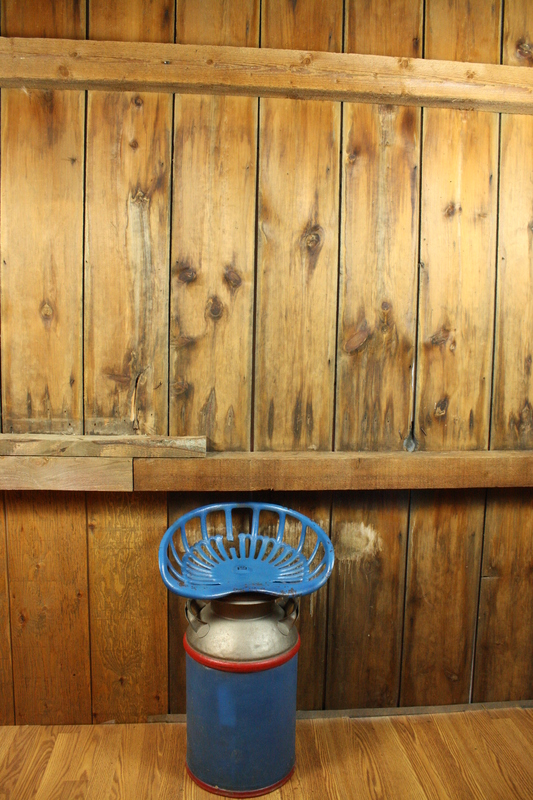 I cleared the back corner of the mow and set up the lights, camera and a few props and a milk can with a seat mounted on top as a focal point for the photo booth. I took a couple of selfies and waited for the guests to swing by and have a fun with their photos. I noted one boy in particular who seen to be hanging close to the camera. He even asked me about getting photos or a CD of the photo. On Sunday when I looked at all the photos he was in about 75 of the 250 photos taken! His finger should be sore! It was great to see someone helping out and keeping up with the positioning of the camera. We played the music until 11 pm and closed the party down. John and Julie with this new adventure want to be good neighbors to the town of Rusk. We did a small clean up that night and would return on Sunday afternoon for the final clean up. It was a grand wedding and reception. 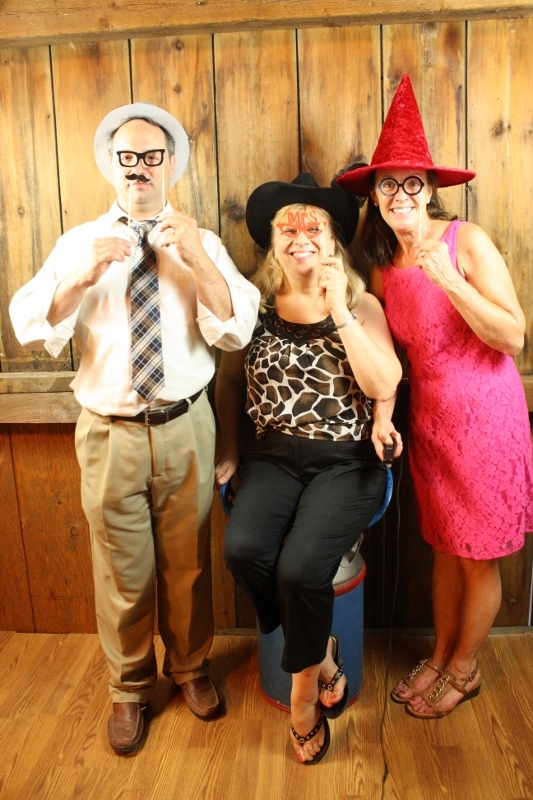 Many people commented on how much fun they had and it was the best wedding party. 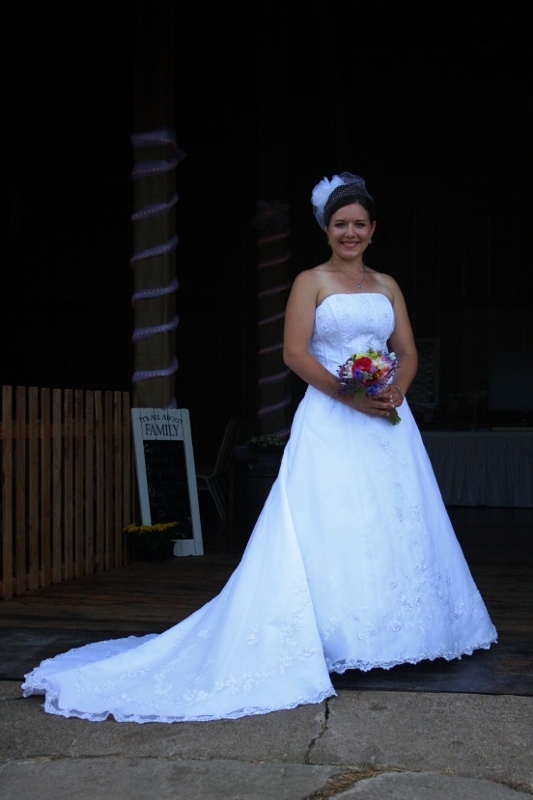 Saturday I awoke and it wasn’t going to be “just another day.” Today is my daughter, Sarah’s wedding day. I awoke early, went out to the coop and woke up the rooster, and got on with the finishing touches for the big celebration. But first I started a big pot of coffee for the household. As the coffee was brewing the groom, Josh, appeared from the basement and asked if he could help with the last minutes details. 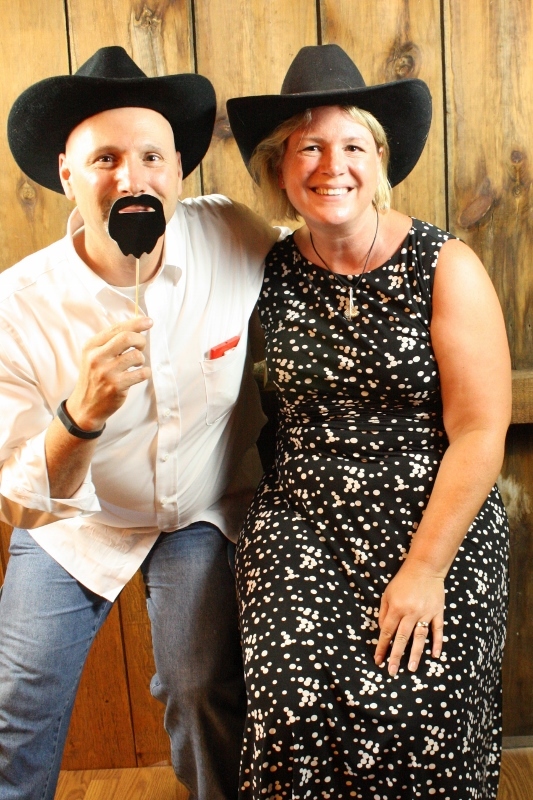 I said “sure”, but before we headed off to the Weddin’ Barn I had one extra task. The night before the minister noted there wasn’t any Christian symbol at the front of the barn. I started thinking about the scrap wood I have lying around the house but it just didn’t feel right. As I awoke I thought of some old barb wire over in he sheep pasture on top of the hill. I walked over and grabbed a roll and headed back to the house. I pulled out a length of wire and bent it back on itself about three times. Then I came part way down and started the cross pieces. 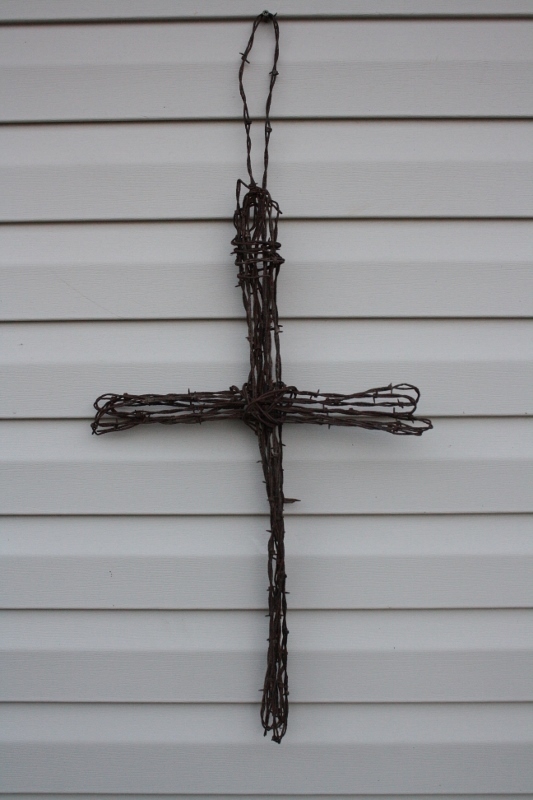 I did a couple wraps at the cross intersection and finished with long tail of wire so I could hang the cross on the wall at the front of the barn. When we got to the Weddin’ Barn, Josh and I hung the cross at the front of the barn. John, the owner, was there doing his last minute details. First order of business was to get the beer wagon in place. Now I was thinking the beer wagon was no heaver than a standard trailer. Boy was I surprised! John came over and said he had moved it last night by himself, but he had used his skid loaded for a little helping hand. He started the skid loader and proceeded to move the beer wagon into place for the big celebration. I strung out the power cords and tapped the beer kegs and root beer keg. I run a little beer and root beer thru the lines so they guess would have refreshments ready at hand. Josh and I headed around the barn and set up a 10×20 tent for extra seating for our dinner guess. Laurel and I had a enough seating for about 200 guess in the barn but the RSVP count was at 230. I spotted a few extra tables if we would need them and we would transport extra chairs from the mow. I still need to make a run to the store for ice and a few other items. Josh and I jumped into the car and dashed over to the store. On the way a mentioned I should get my hair cut. So we made a small detour and inquired about getting the Father of the Bride fitted for the big show. The manager told me it would be a 20-30 minute wait. I said that would be ok and we would go and do our shopping thus, killing two birds with one stone. We picked up our supplies and went back and waited a few minutes for the manager to call my name. Chris, the manager, asked me about my needs for this hair cut. I told her my daughter was getting married today and the camera needs to capture my best appearance. After the hair cut Josh and I headed home to get ready for the wedding. After a little time grooming in the bathroom, we changed into our wedding clothes. We both had long sleeve white shirt and dark wool pants. Josh also wore a vest. Then we needed a knot to tie it all together. I stayed in my bedroom trying to tie the perfect Shelby Knot. It took me 4 try’s and I still wasn’t happy but it still looked respectable. Now Josh was totally lost when it comes to tying a tie. He said the last time he wore a tie it was a clip-on. I stood in front of him and spun up a perfect Shelby Knot to adorn the groom on his wedding day. 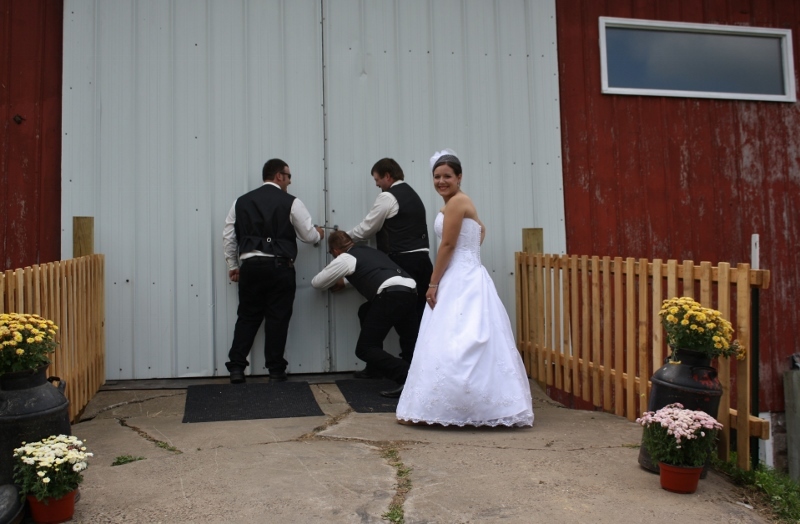 We headed back to the Weddin’ Barn and waited for Josh to get his first look at his bride. Sarah was in the bride’s room getting ready for her big day. 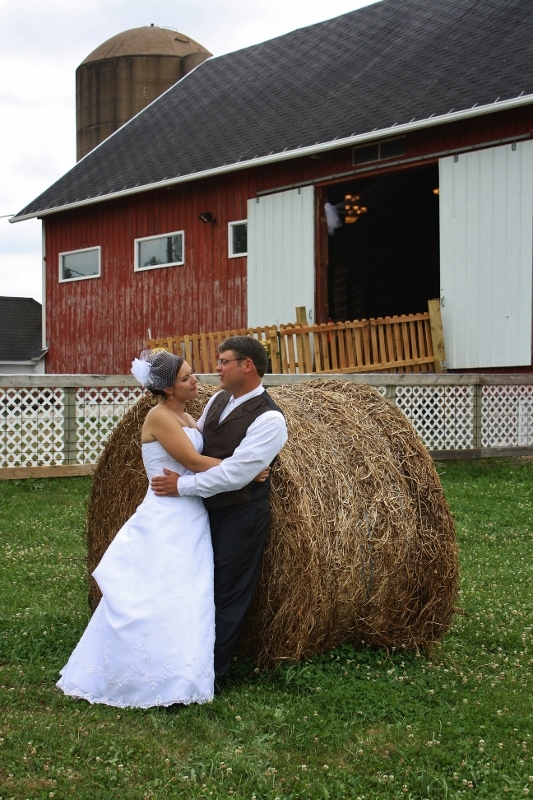 The photographer came as scheduled and placed Josh in he doorway of the hay mow with his back out. He stood waiting for Sarah to stroll up the ramp and tap him on the shoulder and giving him his first look at his wife to be in a few short hours. Shutter buttons snapped photos of the happy couple and faded away leaving the couple a few private moments to themselves in the doorway of the mow. 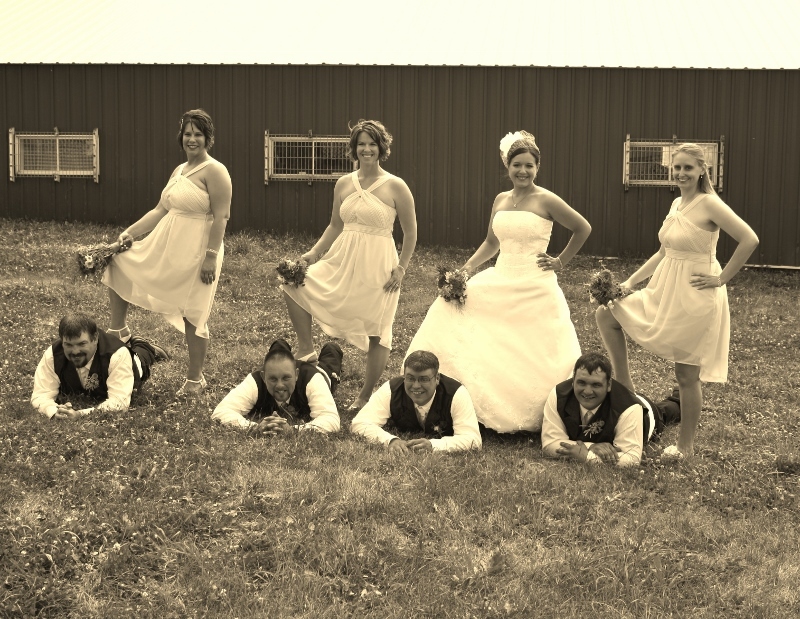 Over the next few hours combinations of bridal party and family photos filled the photographer’s SD card. Then came the hour for the service. All the chairs were filled leaving a stand room only crowd filling the back of the mow. The day was hot and the humidity high. There is a big fan high in the mow to draw hot air out, but we turned it off for the service. After the statement of marriage, three readings and a song the minister said to leave the fan on and he would talk over the fan noise. With the power of a good sound system the minister’s voice filled the mow with his words for all to hear. They did shut the fan off for the other song that was sung by my Dad and his brothers. They dedicated the song to Josh’s parents who had died and August 16th would have been their 34th wedding anniversary. The 5 five brothers sang their hearts to Josh’s parents and to all who weren’t able to be there with us on this day. 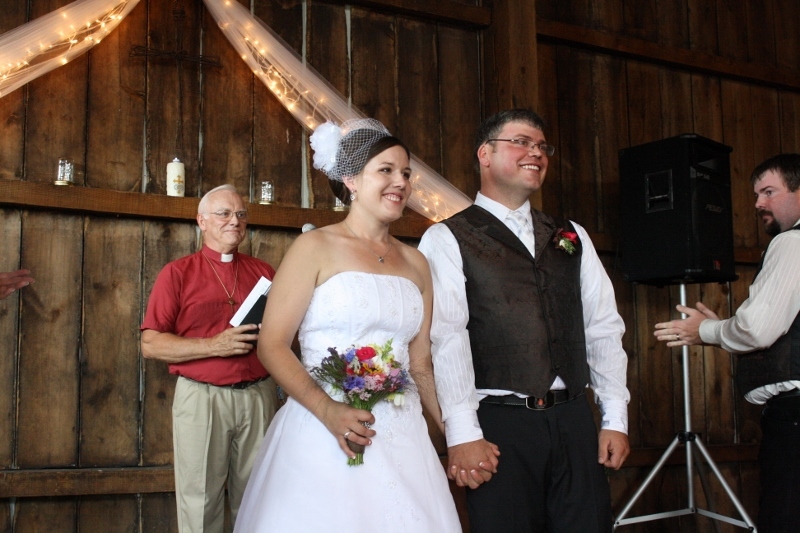 The service ended with the introduction of Mr. and Mrs. Weltzin. The newly formed family exited the mow to cooler weather and greeted their guess. 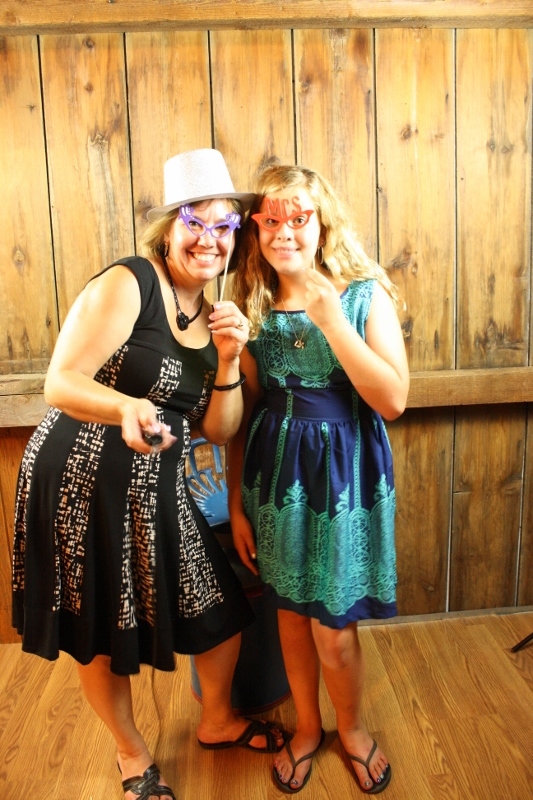 More to come from the reception and dance…. Today lead me on a quick trip to Zumbrota MN. I needed to drop off some livestock at the market so I can receive some “seed” money for planting the new hay crop. 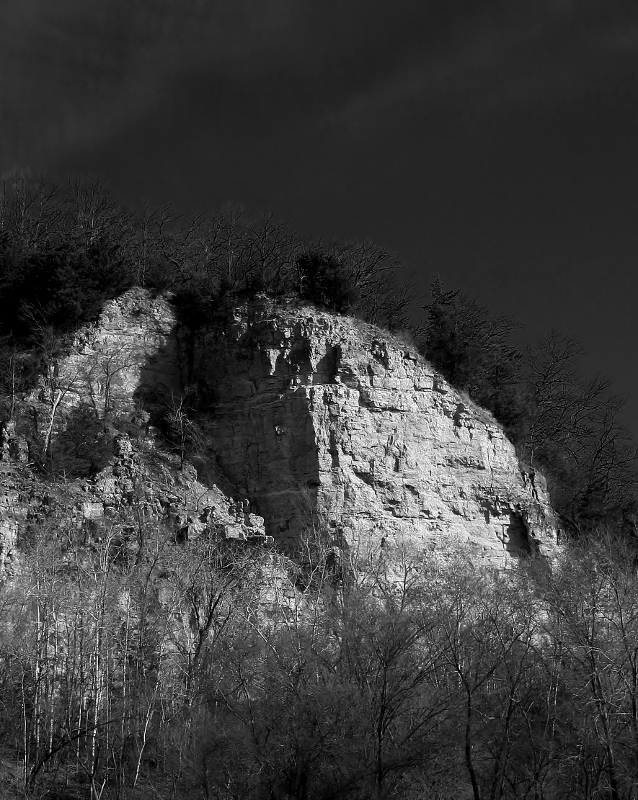 I took my camera with me and snapped a few photos of the out-cropping bluffs lining the Mississippi River valley in Red Wing MN. Enjoy today’s photo. A little father-son time this weekend. My Dad called me Saturday morning and left me a message on the answering machine. He said he had the boards and if I want to come over we could start rebuilding the bale wagon. Now this wagon has been a safety hazard for many years. Every year we get ready to bale hay we check over the wagon and say we should replace the floor. But if we noticed the floor was bad enough we just laid down another sheet of plywood to cover over the bad area and started baling. This year we are going to think about our safety. We don’t need a broken bone trying to bale hay. So I went out to dad’s and we pulled the steel cage off the floor. We didn’t have to remove any of the bolt holding the bale cage on the wagon. The wood was so rotten the steel was about to fall off the wagon. We lifted the cage and blocked it up and pulled the wagon out from under the cage. I pulled out to a burn area and Dad lifted the old floor off the running gear with his loader tractor. Over it went in a heap. Back to the buildings I went with the empty running gear ready to rebuild the floor. Before we attached the new floor board I thought I would grease the running gear. So I went into the shop and picked up the grease gun and went out and started pumping grease to the spindles. The first spindle resisted the grease but soon started allowing the flow of grease. The second spindle just refused to take any grease. Dad said “well it’s a fifty year old wagon.” So I started questioning him about the history of the wagon. Dad had a chance to tell me the history of that running gear as we rebuilt the new floor. That running belonged to his father. Was it new or used my dad did not say. My grandpa took that running gear and made his first chopper box for chopping hay and corn to feed the cows. My dad stated he did that in about 1957. Dad said he never used that chopper box because we working for another farmer. But I remember going to grandpa’s and grandma’s and helping my uncles unload hay out of that chopper box. Yes the days would be hot and you would be sweaty and hay chaff would stick to your body under your shirt. I may have been 8 or 9, but I still remember those days. Then 10 years later my grandpa took that box off and replaced it with a self unloading chopper box. After my grandpa died my dad and uncle started farming and shared the machinery together. They took off the self unloading chopper box and replaced it with the bale rack which they have used over the last 30 years. Now today that same wagon has a new floor. It was Me and my Dad that worked together to replaced the floor and I was given the history of a wagon. Yes the floor will last another 30 year and my father will not be here on earth to see it get replaced again. Maybe it will be a son-in-law or a grandson who will help me replace the floor the next time and I can tell them the history of this wagon and they will continue use the wagon and pass on the history.